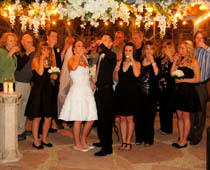 Mon Bel Ami Wedding Chapel can also handle your Las Vegas wedding receptions on site. 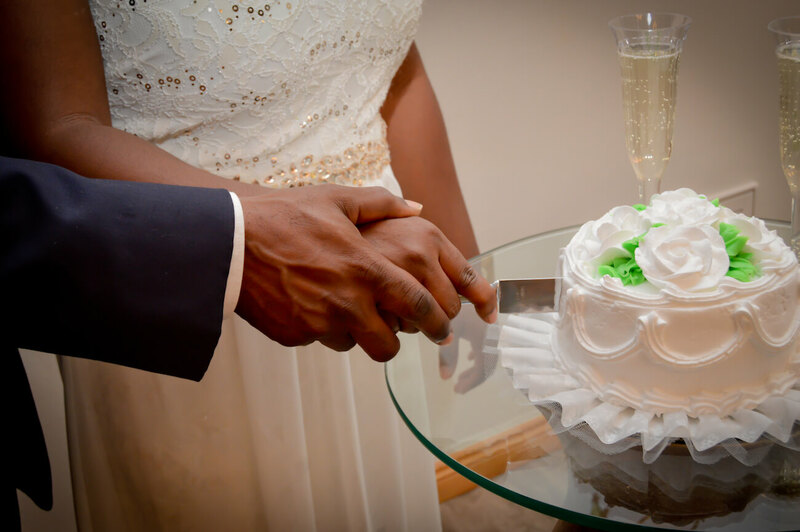 Château Bel Ami offers wedding receptions complete with appetizers, beverages, wedding cakes and more. 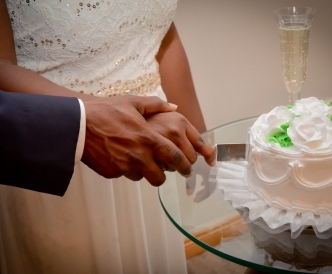 Your reception can be customized to fit your needs or you can choose from one of our affordable reception packages. 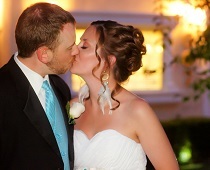 While you are here, check out our Las Vegas weddings with receptions that are already bundled for even more savings. 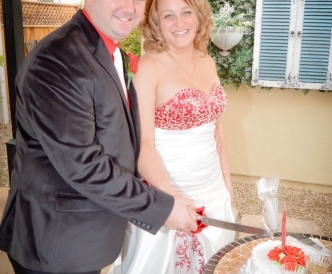 Otherwise, feel free to fill out our custom Las Vegas wedding form and tell us exactly what you are looking for. A toast to the bride and groom immediately following wedding ceremony held in our chapel garden. $35 setup, plus $7 per guest. 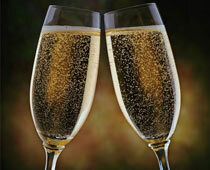 A one hour reception for up to 20 guests, including wedding cake, ambient music, dressed tables, a toast and more. 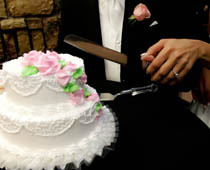 A two hour reception for up to 30 guests, with two-tiered wedding cake, ambient music, dressed tables, a toast and more. While outdoor receptions are available in our chapel garden (see below), Château Bel Ami is our main reception space. Located on the our property just behind the wedding chapel, gazebo and pavilion, Château Bel Ami is a completely private venue, offering your party and experience like no other on the Las Vegas Strip. 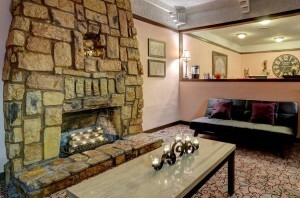 Most Las Vegas wedding chapels do not offer receptions on site. 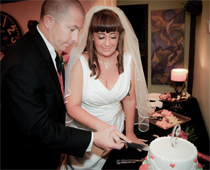 If you plan on getting married in Vegas and want a reception afterwords, our wedding with reception packages have been designed just for you. Not only will you enjoy significant savings on both, but you will also enjoy the very best customer service available in the city from start to finish. 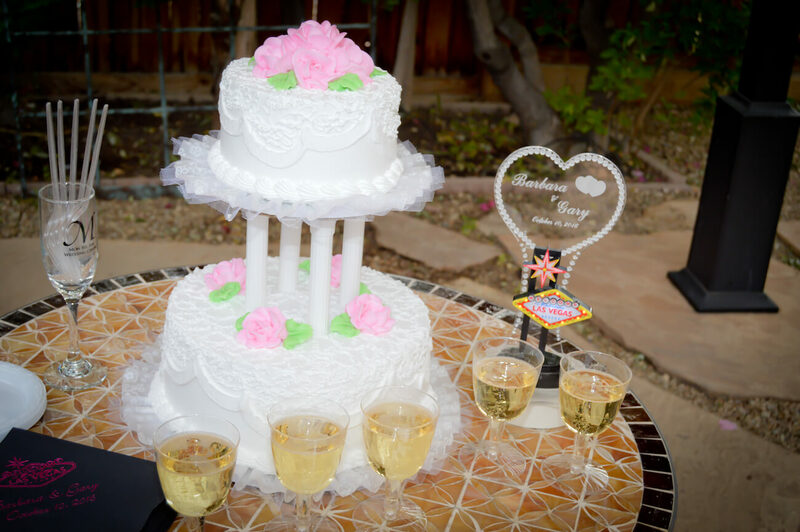 A gorgeous Las Vegas wedding and hour long reception for under $1,000? It can’t be true except at Mon Bel Ami. 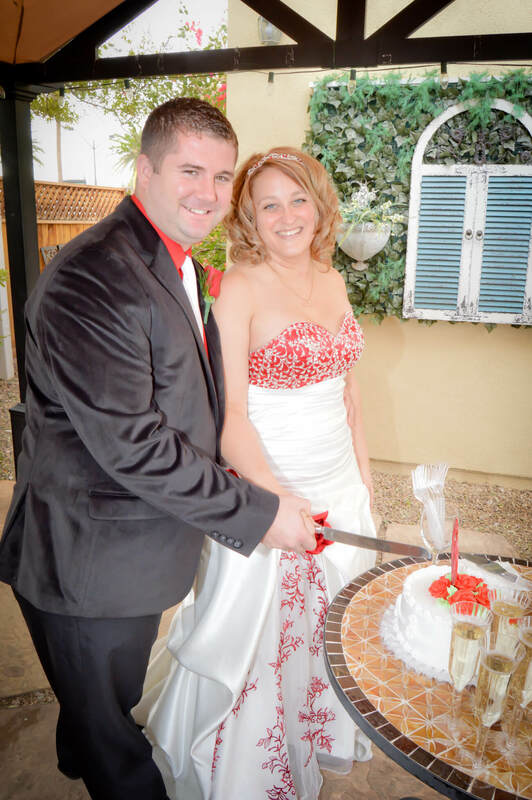 An all inclusive Las Vegas wedding package that includes our most popular services and features as well as a wedding reception for 0 – 30 guests in the Château Bel Ami. Absolutely everything. 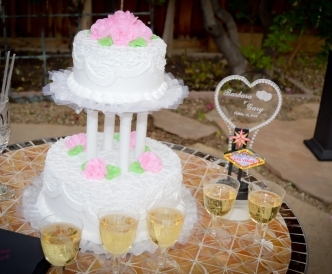 For those that want it all and more, Mon Bel Ami Wedding Chapel proudly offers our Extravagance Las Vegas wedding with reception package. You can spend $15,000+ for a comparable wedding with a reception at one of the major resort wedding chapels or you can get a far superior experience for much, much less at Mon Bel Ami. What’s a wedding reception without the wedding cake! 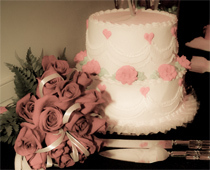 We offer 1 and 2 tier wedding cakes for your celebration. Fillings: Bavarian cream, chocolate, strawberry, raspberry, blueberry, banana, and more. 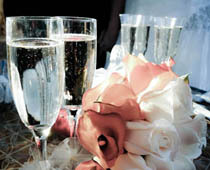 Château Bel Ami offers a non alcoholic Champagne Toast to the Bride & Groom. Fruit Tray: A bountiful array of seasonal fruit. Mini Club Sandwiches: Layer upon layer of sliced premium turkey breast, baked ham, American, and domestic Swiss on wheat and white breads. Garnished with green leaf lettuce and deli sliced pickles. Hye Rollers (pin wheels): Soft Lavosh flat bread layered with cream cheese, baked ham, premium turkey breast, Provolone, tomato, and green leaf lettuce. Then it’s rolled up and sliced, yielding a colorful spiral of flavor. Mini Croissants: Flaky, light, and buttery croissants layered with baked ham, roast beef, or premium smoked turkey breast, and American cheese. Garnished with leaf lettuce, olives, and sweet pickles. Party Roll Sandwiches: Your choice of crusty French, potato or soft dinner rolls filled with smoked turkey breast, baked ham, roast beef, American cheese, and leaf lettuce.